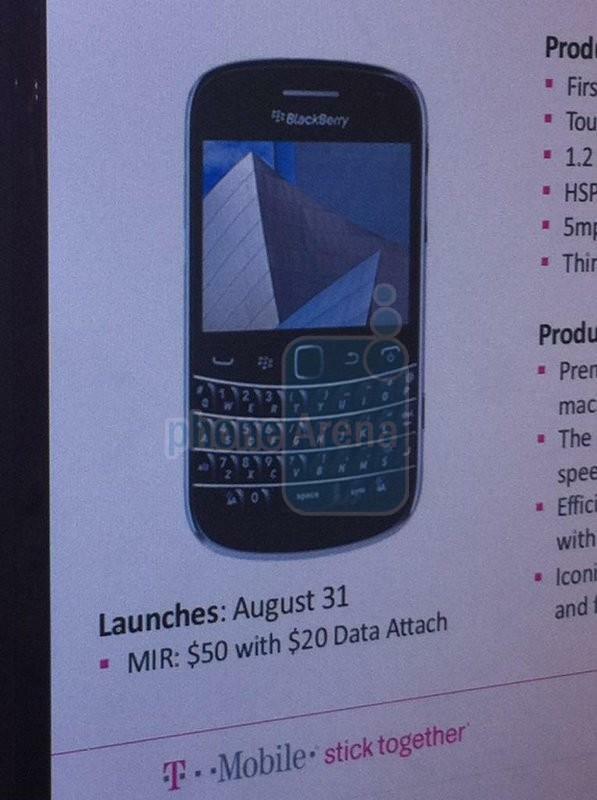 We’ve been calling for a late August release for the Blackberry Bold 9900 for quite a while now and thanks to a leak provided to the boys at PhoneArena that timeframe looks to be all but confirmed by Magenta herself. While the two-year contract price is unknown we do know the phone will come with a $50 mail in rebate that requires a $20 data plan attachment. 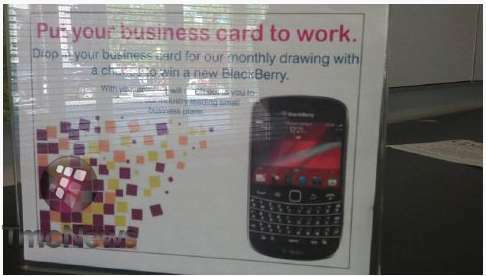 On top of that we are getting glimpses at some store marketing material as that shows the Blackberry 9900. We’re eager to get our hands on the Blackberry Bold 9900 if only to relive Blackberry’s glory days and see just how they’ve perfected an already excellent handset. If only QNX was on board, Blackberry might have a real star on their hands. So it’s 4g right? HSPA+ 14.4? Man I can’t wait! It’s almost time to retire my 9780.
wow a blackberry that looks like every other blackberry! HOW EXCITING. good lord how is RIM still in business? And you say this because Androids and iPhones all look completely unique from each other. Exactlyy! No one ever talks about how the iPhone design never changes much, or how HTC makes the same slate style 4″ phones year after year. If a design works for your company, why change it? No one talks about the iPhone design never changing much – errrrrr……thats coz it changes yearly. There are dozens of Android phones that are different. Maybe you need to stop defending BB and start opening your eyes to how the phone market has changed. i duno man, my mytouch slide looks nothing like an iphone. Wow, an iPhone that looks like every other iPhone! Wow, an Android that looks like every other Android! Ever think that people tend to prefer the look of their phone, be it BlackBerry, iPhone, Android, or whatever?! I don’t care how awesome Android or iphone or any other phone. I can instantly chat with my family and friends overseas, and send pics of my baby and send my parents videos of my baby starting to walk and so on for FREE using blackberry. And that my friend, makes blackberry the most awesome phone. End of discussion. Um, what? You do know that Android devices can do this too, right? Why do you assume they can’t? A good friend of mine moved to Israel last year and we constantly keep in touch on our Android phones. We can even video chat, which currently isn’t available on blackberry. well with wifi android might be free, but BBM and blackberry email etc. is free over the gsm network when you have certain plans or international BB service. Try data usage without wifi outside of your home country and check your bill. That’s true with ANY platform, I think. I was under the impression that P-Dubs is refering to talking with family and friends who LIVE overseas. Like P-Dubs lives in the US and she/he’s talking to friends and family in, say, Spain. Is the screen the same size as the 9700/80? We use 9700 and 9780 here at work and they’re hogs. Hopefully 4g for this model will make a difference. Blackberry was an awesome innovator back in the day… I wish they would catch up I have a feeling it is the short sightedness of one of the co-ceo’s that is causing them to get behind… How I wish a BB would come out that can play android games, run netflix, posses a 1.2ghz X2 processer,480×800 and finally an 8MP camera. Love that it requires minumum $20 data package. Because then all customers would add the $10 one. It helps us reps out with our sales.